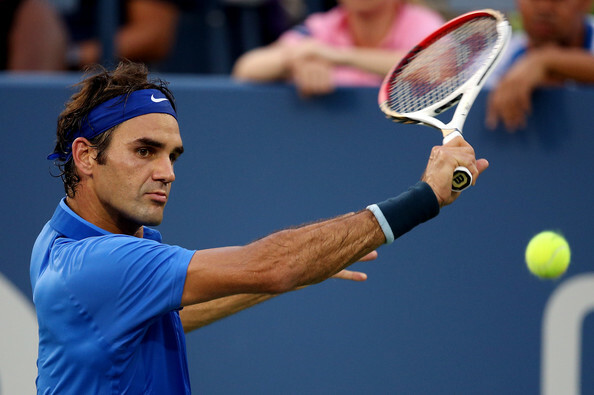 Roger Federer was knocked out from US Open by 19th seed Tommy Robredo 7-6 (4), 6-3, 6-4 in a Round of 16 match on Monday. 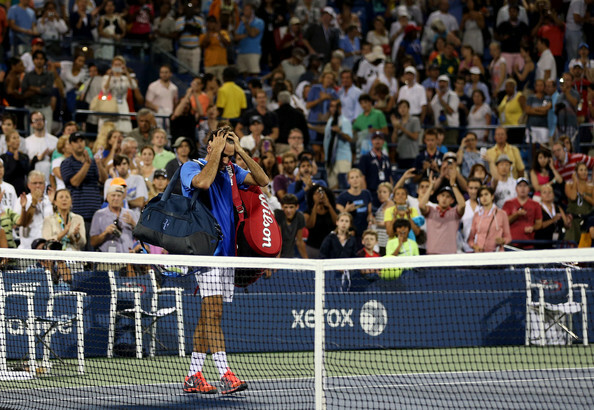 The match got delayed due to rain & was shifted from Arthur Ashe to Armstrong stadium. This was the first time after 6 long years (last being on 7th September, 2006 when Federer had to play Giquel in the 4th Round of US Open, 2006). Roger Federer got broken on his very first service game & this was the 3rd time in US Open, 2013, when his service got broken in his 4th match at US Open, 2013. But, how ever, Federer broke back Robredo's service in the 4th game to level the set at 2-all. Federer had break points in the 8th game but couldn't convert. How ever, Robredo broke Federer's service in the 9th game to gain a 5-4 lead. But, Federer broke back the very next game to level it at 5-all. The set went in to tie-breaker. Tommy Robredo won the last 4 points of the Tie-Breaker to win the first set tiebreaker 7-3 in 56 minutes. Though, as you can see, Federer won 44 points to Tommy's 45 but committed more unforced errors & his first serve % was only 57. 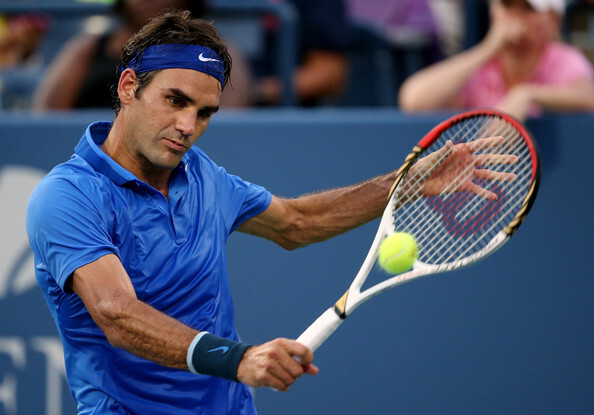 Roger Federer had a break point in the first game & then had three break points in the 5th game but couldn't convert. Tommy Robredo broke Federer's service in the 8th game to get to a 5-3 lead. Federer then again had two break points, but couldn't convert as the Spaniard served out the set 6-3 in 42 minutes. Though, Federer's 1st serve % improved, but once again those plethora of unforced errors & the inability to convert break points costed him the set. The Swiss Maestro had 5 break points in the 4th game of the 3rd set. After the Spaniard saved those 5 break points, it became almost sure that Federer's chances of a comeback in the match have almost diminished. After that game, Federer's game really deteriorated and errors started flowing from his racket. Federer got broken in the 7th game after 4 consecutive unforced errors from Federer gifted the Spaniard the crucial break to lead 4-3 in the 3rd set. Robredo served out the match in the 10th game & in 2 hours, 28 minutes upset the 5 times champion Roger Federer 7-6, 6-3, 6-4. Again Federer's inability to covert break points & his unforced errors costed him the set. Federer had 45 winners & 43 unforced errors & could only convert 2 break points out of the 16 he managed to get & that was the primary reason for his loss. 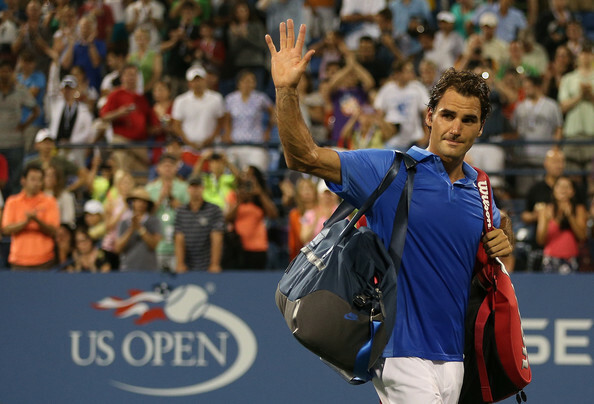 Inspite of this loss, Roger Federer will be ranked #6 after US Open, 2013, read the indepth explanation of rankings post US Open, 2013, right here. 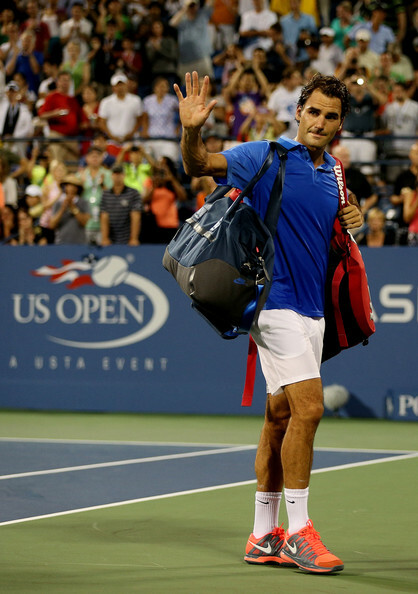 Roger Federer clarified after the match, that his back is fine. Also, Roger Federer ruled out making any further changes in his schedule for ensuring that he qualifies for World Tour Finals 2013 (thus, Federer ruled out playing at Tokyo or Beijing). Also, Federer stated that, he kind of beat himself today. Scroll down for in depth match analysis, discussion, pics, interview quotes & video highlights in the following posts. It is shocking, though not as shocking as it would've been 6 months ago. I hope he bounces back from this. This year has been rough for him. Losing to Benneteau in Rotterdam, Nishikori in Madrid, Tsonga in Paris, Stakhovsy in Wimbledon, Delbonis in Hamburg, Brands in Gstaad and now Robredo in NY. Roger of 2012 wouldn't have lost all these matches. 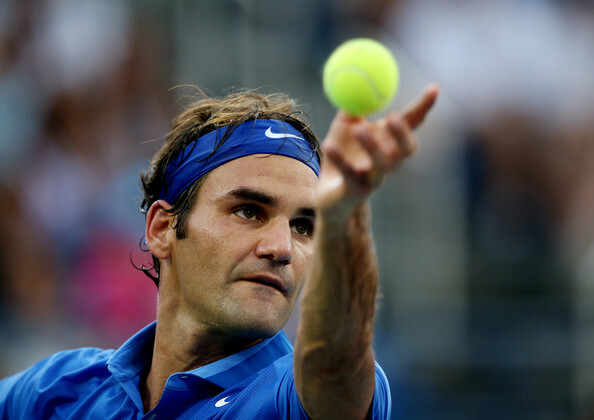 He still has the ability to produce some good tennis, so let's hope he regains consistency in 2014. 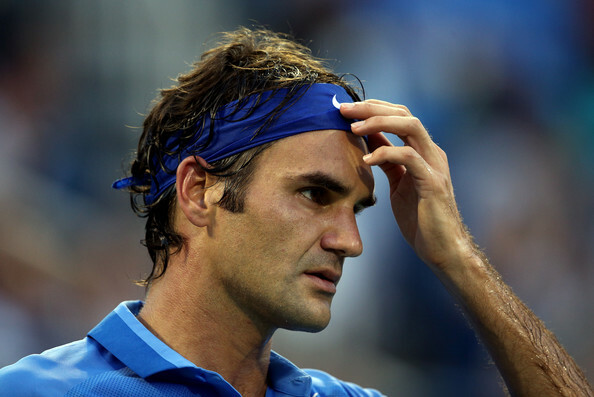 Also, is this the first year since 2003 that Roger has not reached a Grand Slam final? I think it is. ROGER FEDERER: No. I mean, that should not be the issue. I've waited for so many matches throughout my career. That's definitely the last excuse you could find, you know. I mean, I've been practicing on Armstrong, so there's no excuse there either. I was prepared for it. I was even happy about it. I thought it was going to be a great atmosphere, that I could, you know, take advantage of maybe the fact that people were really going to get behind me, make it a great atmosphere. But unfortunately, you know, I didn't show the game that they could really get into it and excited about. That's how it goes sometimes. ROGER FEDERER: Yeah, I mean, I think I started badly, which put me down a break. Then I was able to come back in that one. But it's true, I mean, I struggled throughout, which is not very satisfying, to be honest. I mean, Tommy did a good job to keep the ball in play and make it difficult for me today. I missed so many opportunities. Rhythm was off. Yeah, when those things happen, clearly it's always going to be difficult, you know. ROGER FEDERER: Yeah, probably. Confidence does all these things. It takes care of all the things you don't usually think about, you know. But I just think it's been a difficult last three months, you know. Maybe how do you say my consistency is just not quite there yet. Maybe on a daily basis, set by set or point by point basis, maybe that's something that has been difficult for me, you know. So maybe that was one of the reasons I lost today. ROGER FEDERER: I kind of feel like I beat myself, you know, without taking any credit away from Tommy. Clearly he was making sure he was making many balls. It was up to me to make the difference and I couldn't. I kind of self destructed, which is very disappointing, especially on a quicker court. Your serve helps you out. You're going to make the difference somewhere. I just couldn't do it. It was a frustrating performance today. ROGER FEDERER: Yeah, I mean, it would have been a quarters, not a final. Not that much of a disappointment at the end of the day. If I'm playing like this, I'm not going to beat Rafa, or Kohlschreiber, for that matter. So, for me, I didn't think of that. I've been too often in this situation. I was fighting with other things in my match today. Not thinking too far ahead of myself, especially the level I was playing at. 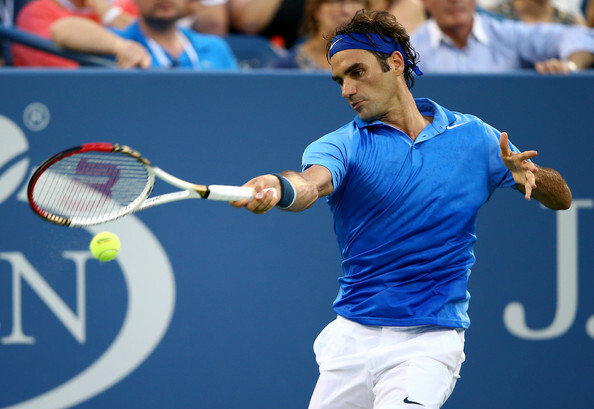 ROGER FEDERER: Actually, believe it or not, Armstrong is a bit faster than Arthur Ashe. Clear, it was very humid. Definitely it's been humid the last couple of days now. That also had an effect on both players, you know, how you can maybe hold the grip, the timing you get through it. But there again, I mean, it's not like it's just humid on my side and not on his. It's all around humid for everybody watching. Yeah, it was a different type of court, atmosphere, surface speed, if you like. But then again, you know, I know Tommy's game really well. We've played so often against each other. There's no secrets out there today. Credit to him for playing a good match today. Q. You're known as such a great closer, 2 for 16 on break points. ROGER FEDERER: Yeah, that was a great close. No, it wasn't a very good close today. Q. No. Could you talk about your difficulty on break points? Secondly, were you overall surprised by your performance today, by the result? ROGER FEDERER: I mean, I think I explained enough, you know. We have a forehand here, end up losing the point like three times. Every time like he comes you play where he's standing, and, I mean, it just ended up being a bad combination of many things today. So I've definitely got to go back to work and come back stronger, you know, get rid of this loss now as quick as I can, forget about it, because that's not how I want to play from here on. I want to play better. I know I can. I showed it the last few weeks, that there is that level. So today was pretty frustrating. ROGER FEDERER: No. I mean, who knows? I haven't thought of it right away, you know. Nothing goes past the hard work, you know. However you want to see it, whatever that means to you, you know, as a player, or in the fitness room, I'll make sure I'll put the work in. Once I decide what that is, I'll believe in it and go after it. So in some ways, as a player, you're always excited about that prospect because there's always something to look forward to, even in a big disappointment like the match today. ROGER FEDERER: I'm not really thinking about it. I don't think I'll change my schedule accordingly. I believe if I do play well, I'll make good results. If I make it or not, then we'll see. But important for me, first and foremost, that I move better, that I play better. My problem is there in training, not actually playing matches right now. ROGER FEDERER: Maybe. Look, then again, it's always been a fine line, especially in the beginning of my career when I didn't have the results to back me up. People thought, Did he even try? Does he care much? Like, He can play so well. Is it so terrible? Now, with the results, I know you don't believe that so much. That's the good thing. The story of my life: when I lose, people are shellshocked to see me play this way. If I win, it's the best thing. Yeah, I can see that. But there's no doubt about it, I'm trying hard out there trying to make it work. Sometimes it just doesn't happen. 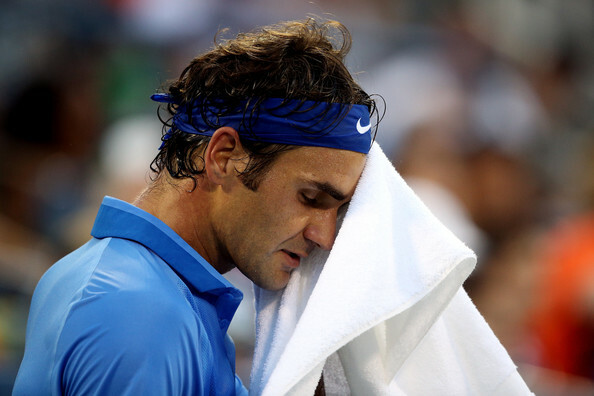 Oh dear, that was not an easy match to watch and to be fair it must have been an unfolding nightmare for Roger. After such an encouraging start last week, although he was not really tested, this match never really got off the ground for him. You could see Roger was frustrated with himself at times. Unforced errors and poor shot placement were far too common. I could not understand when he had worked Robredo over to the side of the court that he didn't make use of the open court to take the point, instead he hit the ball back to Robredo! He certainly had opportunities to break but when it came to the crunch he just couldn't take them. It was as if Roger was there in body but but fully engaged in mind. Maybe he was mentally exhausted, who can tell. In the press conference he said his back was fine and he was certainly not restricted when it came to stretching and bending. I feel he needs a good break to recharge his batteries. The repeated build up and knock down he has suffered this year must have dented his confidence and this cannot have helped. It is a very lonely place out there, with all the world watching as you implode. I have great sympathy for Roger and long to see him bounce back and wag that finger at the doubting media, rather than to question a line call! Actually I felt that Federer would lose but I didn't expect a loss like this...I'm so sad i was waiting for the Classico FEDAL match..
Next up for Roger is Shanghai in October...... What do you think guys, should Federer play an Exhibition matches or must take some rest??? It was indeed a difficult match to watch. It was definitely a mental rather than a physical problem. As you say, Wendy, it was difficult to understand some of the returns he hit right back at Robredo when he had the whole court to choose from, and his inability to follow through when he had 3 game points. How many times did that happen for goodness sake? I can't help wondering to what extent he was put off by the change of courts. Although he said it didn't matter to him I think it might have. Moving his match gave a clear message that the Rafa/Kolschreiber match was the more important one, right? I'm sure he would have felt that, and it only takes a small niggling idea in your mind to spoil things when you're playing at that level and need total concentration and total belief. I thought the same thing about the Wimbledon shoes. If I were Roger I would have been very annoyed about that and it would have been in the back of my mind, especially as certain other female players had much vaster areas of colour on display than the soles of Roger's shoes, but were not asked to change. If I'm right and the court change was an issue, then the organizers have deprived themselves of the one match they most wanted - rafa/roger - by making that decision. I feel sorry for Roger today. He must be feeling very down. I just hope he picks himself up quickly and looks forward not back. 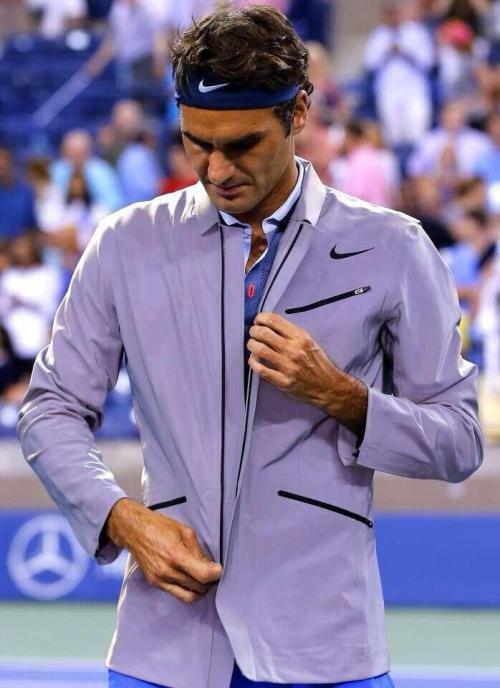 I know he has the strength of character to do that, and he has proved, especially with the Cincinatti match against Rafa, that he still has the game capable of beating the very best. I hope he remembers that and not this last loss. Allez Roger, we're all with you! He shouldn't play exhibitions, I think It would be better to play in Beijing instead. He needs to win competitive matches. There's no time for shows at this stage of his career. He should take these few weeks as an opportunity for some real physical, mental and technical training, and should just get into serious business. Much like the way Nadal used those 6 months to get ready for come back. 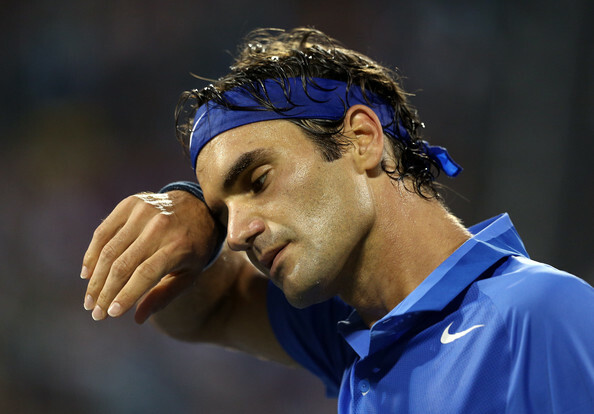 Roger looked fine physically but I think he is doubting himself right now. He just has to regain that confidence and then he should be fine. I agree he shouldn't play exhibitions. He is, still, sorely lacking in competitive matches. He needs to win a few tough ones. I hope he can get that experience in Beijing. I do so wish he didn't have to read all the rubbish that will be written now. First he was finished, then he was proving he's still a great, and now he will be finished again. I can't bear to look at that photo of him with a tear in his eye. It's making me cry too. i wish there was something I could do to help - I suppose we all do. All we can do is offer our 100% support and belief. You have a good points there Rita. These days I often think the press coverage and press conferences are a greater ordeal than the match itself. Outwardly Roger copes with it remarkably well, but you have to wonder whether things that are said and written do play on his mind and as you rightly point out the silly hoo haa over his shoes at Wimbledon then maybe the change of court here at the US Open. Who can tell, my guess is the our Roger is a sensitive guy and these things can hurt or disrupt his equilibrium before a game, even if, as with the shoe saga, they are an irritation that plays on the mind. There is no doubt he is physically fit, what I feel he needs is to train his mind to override these things, relax and enjoy then the rhythm will come. When he's tensed up like this it is a vicious circle and he's his own worst enemy. I sincerely hope that Roger can get away for a while and just enjoy himself. We fans will continue to support him and love him. Nobody can take away what he has achieved. Very few will equal or better what he has achieved. OMG that first pic made me cry!!! Well sad a very sad way to see the champion lose yet again. Still not able to shrug of the dissapointment. But we all have to take what has happened in good spirits and that holds true for Roger himself. Now we have to look for the way forward. And I beg to disagree with most of those who thinks a mere time off from the game will make him play better. No i think he should take a short vacation and then really start training on his body and fitness first. He has to do some exercise to getthat fluidity in his movements back on track. 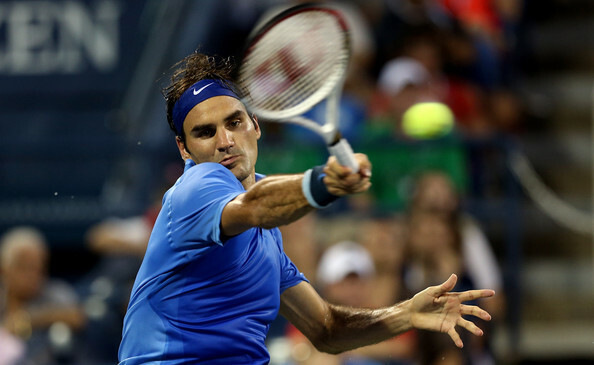 .timing is the key to Federers game and for timing to be perfect movement has to be precise. Roger has always been excellent withhis footwork except for the last two seasons . He has to get this rightfirst. Secondly he should work hard on his game and by game i mean he has to work on the groundstrokes especially down the line shots from both wings. He also should work on the tactics and strategies. In the past he used to have no strategies for any player . He was so damn good that if he played his game well the opponents most lethal weapon also got blunted by rogers beautiful game. Now things are different , he is getting older and he needs to find ways where his opponent is weaker. And i sincerely feel He should fire Annacone. This coach has nothing to give to roger and knows nothing about the changes in the modern game of tennis. He encourages roger to play serve and volley which at best in the modern game can only be used sparingly as a surprise tactic. Such is the slow nature of the courts today and the technology of the strings , the chip and charge , and the approach shot are not good against the likes of zenia, berlocq and robredo let alone nadal and the other top guys. And if that serve andvolley technique is to be employed then what about working on Rogers volleys and positioning of the net. There is ample chance of improvement in that department of Rogers game and annacone hasn't worked on this area at all. Change is necessary and this change is the way forward. Also he should now play with the larger head , noot cecessarily the same prototype which he was using but nonetheless a new frame with larger headsize is the way forward. Its always sad to see a legend of the game fading away and its equally amazing to see that fading legend truimph and be at the pinnacle again. The first part you saw in 2013 , the next part you will see in 2014. 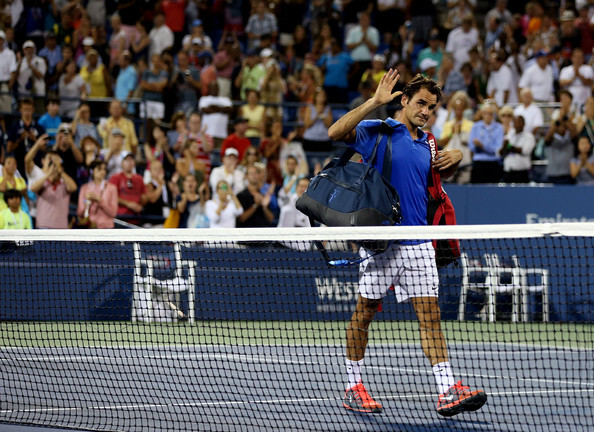 Good luck roger , stay healthy , stay hungry, fight till the end but always keep smiling. For as whatever happens from here on we fans the true fans of roger will always behind you support you love u till the end of time.